Happy Passover!! I know it’s a bit belated, but I still managed to sneak in this recipe before the end of Passover. Passover is one of my favorite Jewish holidays; actually one of my favorite holidays, period. I love how it centers around family ritual and retelling the story of Moses and the early Israelites. Plus there are many ways to tie in current events and generate discussions with the girls about freedom, slavery, persecution, and other social justice topics. The Passover celebration centers around the seder meal with its seder plate. The plate holds symbolic foods – a lamb shank signifying the sacrificial lamb, a hard-boiled egg representing new life, etc. Charoset represents the mortar used by Israelite workers while enslaved in Egypt. 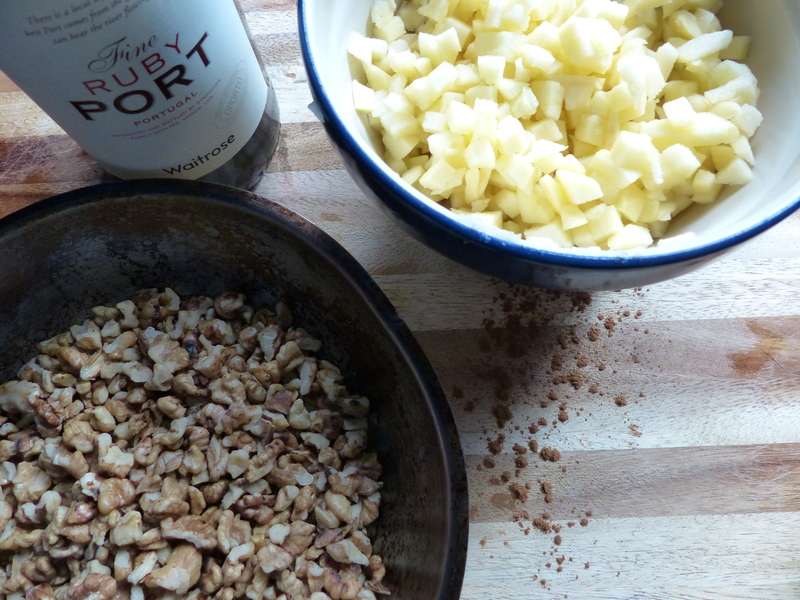 It’s components are pretty simple – apples, walnuts, sweet wine, cinnamon and sugar. There are many variations, but the fruit/nut/wine combo is pretty essential. 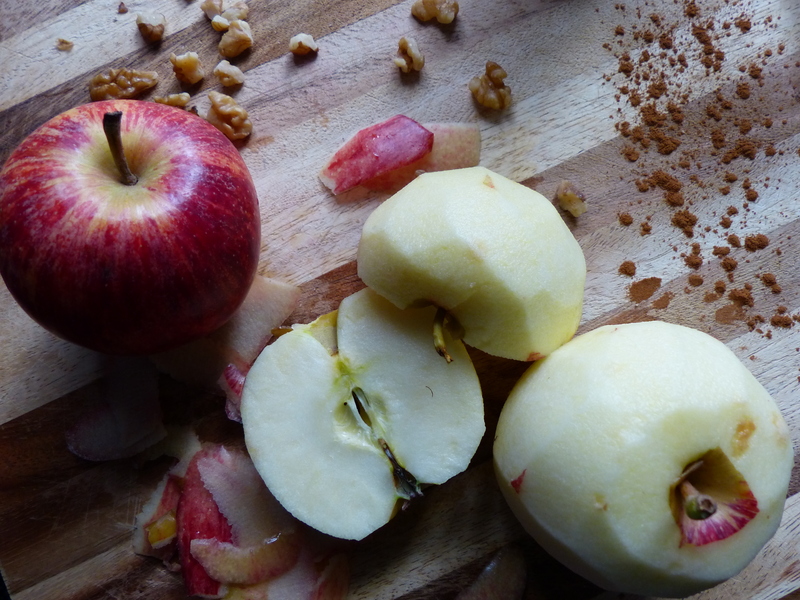 You can either chop the apple and walnuts for a chunkier version or you can get it to resemble true mortar by blitzing in the food processor. It’s one of our favorite Passover foods, and a food that I always say I’ll continue to make after Passover. 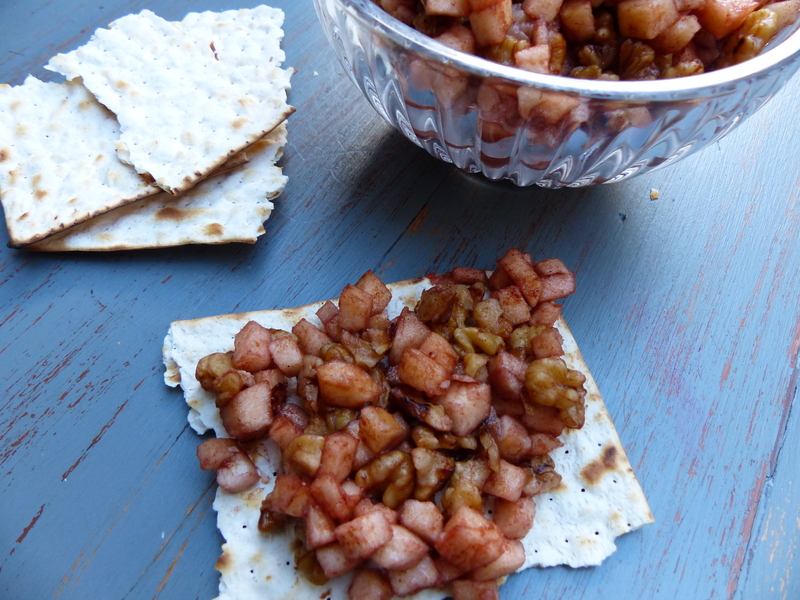 It’s a great snack, spooned onto matzo crackers or any cracker for that matter. It’s also a nice accompaniment to pork or chicken. 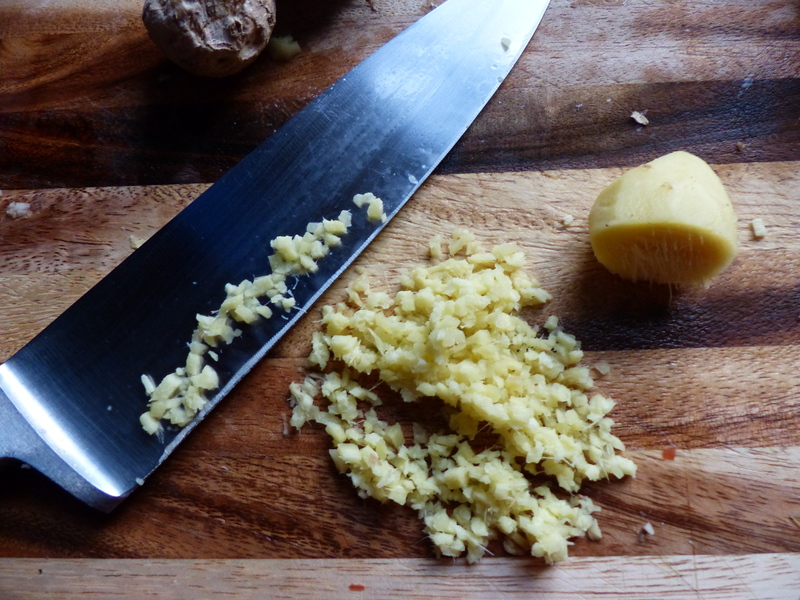 Note: If you prefer a more spreadable, mortar-like charoset, all the ingredients can be combined in the food processor and processed into a rough paste. 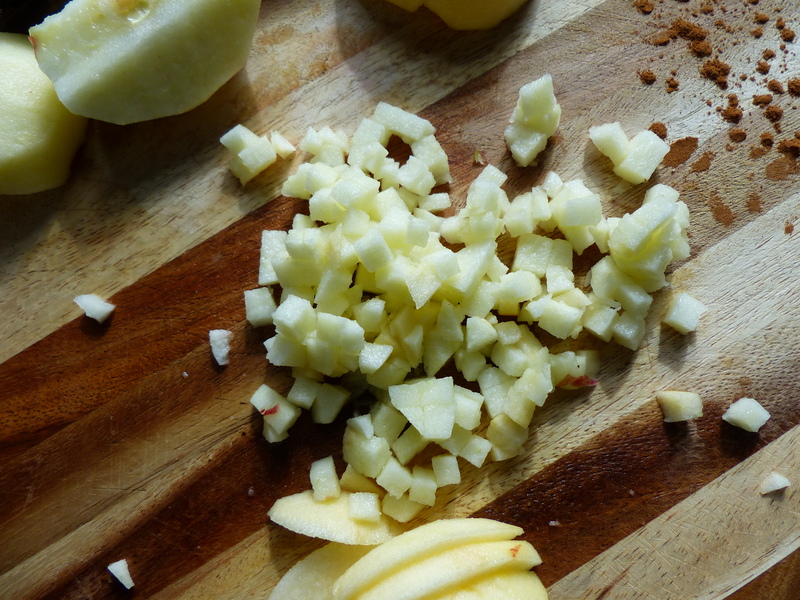 If you chose this method, be sure to roughly chop the apples before adding them to the food processor. Chop the apples finely. 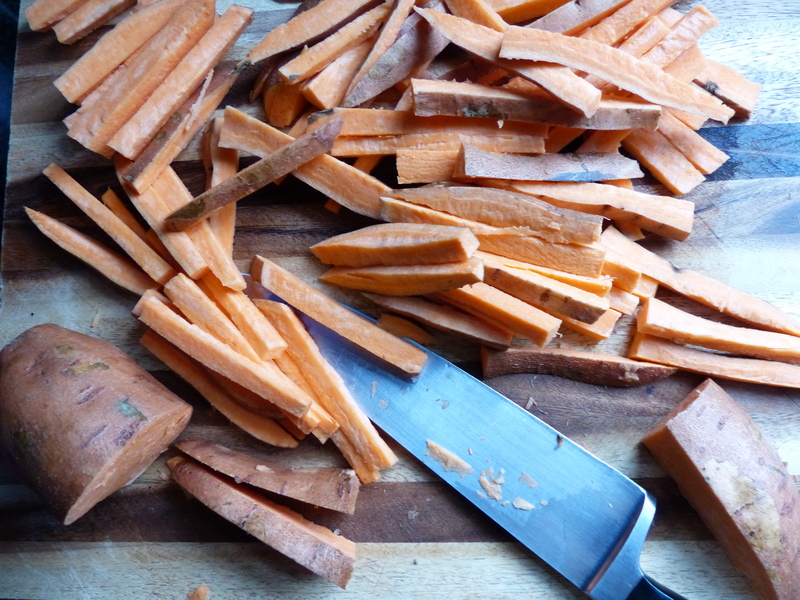 You can use a food processor for this – just make sure not to overprocess. 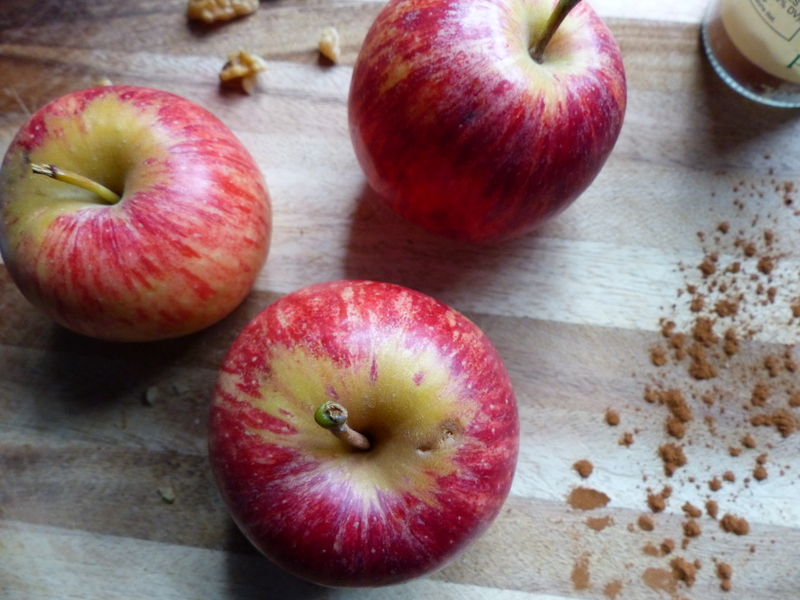 Combine apples with the other ingredients. 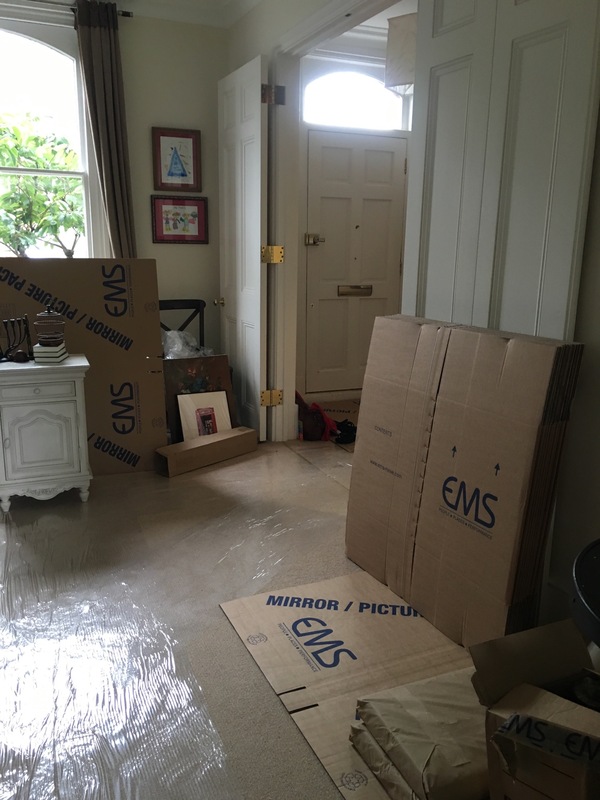 Store, covered, at room temperature until ready to serve. Store any leftovers in the refrigerator for a few days. This is one of those recipes I’m not quite sure how to categorize. My daughter eats the entire batch in one sitting, so I’d think that qualifies as a main course. 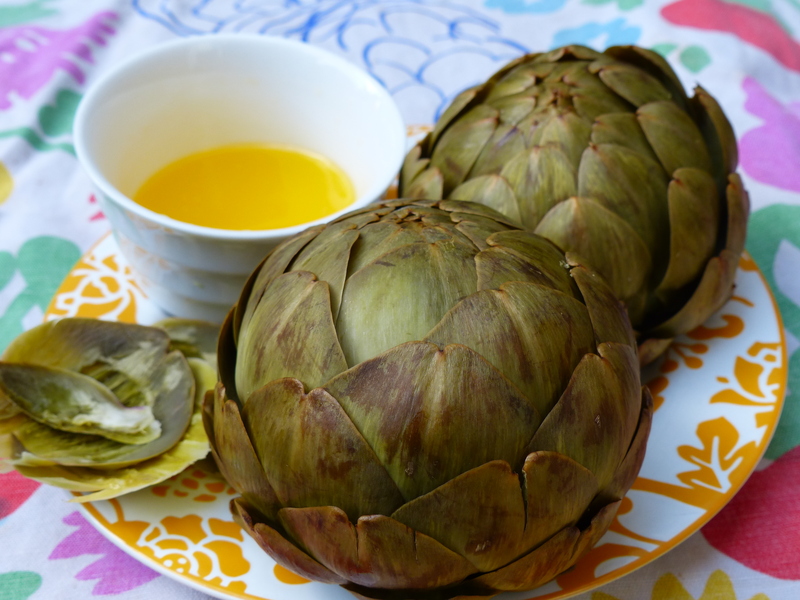 However it also makes a great protein-packed snack as well as a side dish to grilled meat or fish. All I know is that lately I can’t make enough of the stuff. I cook up a batch, then turn around and it’s been consumed. Many people are a bit skittish about Indian food. “It’s too spicy” is a common complaint – and misconception. There’s some Indian food that definitely has a kick, but you could say the same for most cuisines – Mexican (spicy salsa), southern U.S. (spicy wings), Spanish (spicy chorizo sausage) or Chinese (Sichuan spicy noodles). This is a great intro for Indian cuisine newbies; a gateway food, if you will. This is also a good gateway recipe for Indian food fanatics who only eat it at restaurants or do take-away/carry-out. I’ll admit I fell into this category, though I do make a mean Chicken Tikka Masala which I’ve since learned falls more under the British cuisine umbrella rather than Indian, though we still love it. 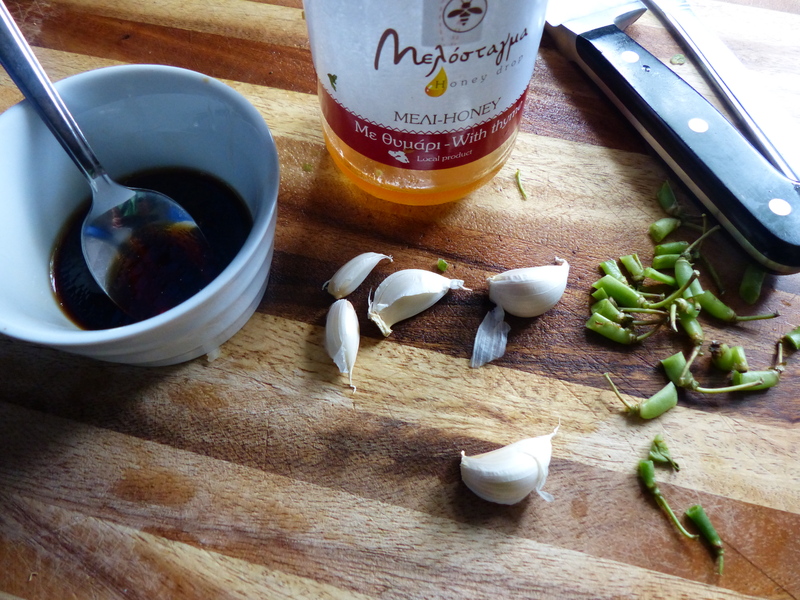 This is a good intro to Indian cooking because it uses pretty basic ingredients. 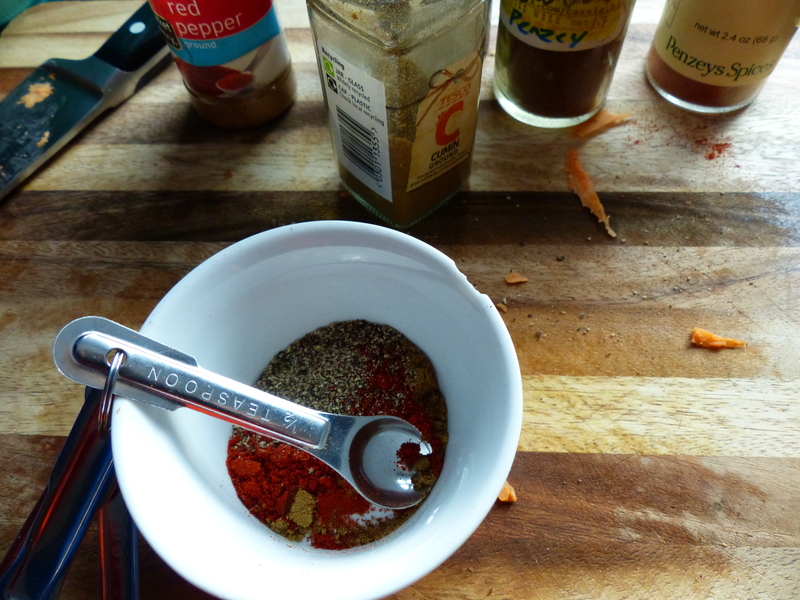 The most exotic is the garam masala which you should be able to find in the spice aisle of most supermarkets (or I’ve included a make-your-own substitute at the bottom of the recipe). So get out of your comfort zone and try something new this weekend. 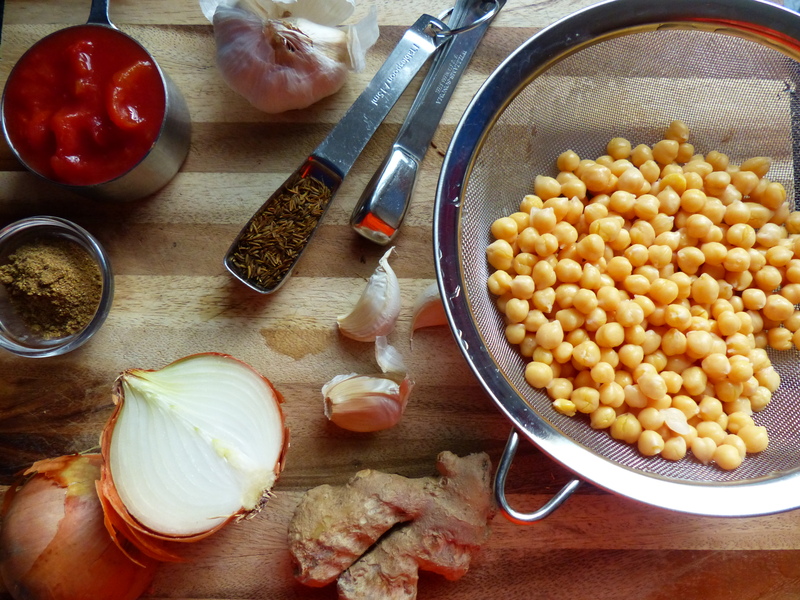 It may be your first time making Chana Masala, but it certainly won’t be your last. Note: This recipe can easily be double, tripled or quadrupled though you may have to slightly extend the cooking time. 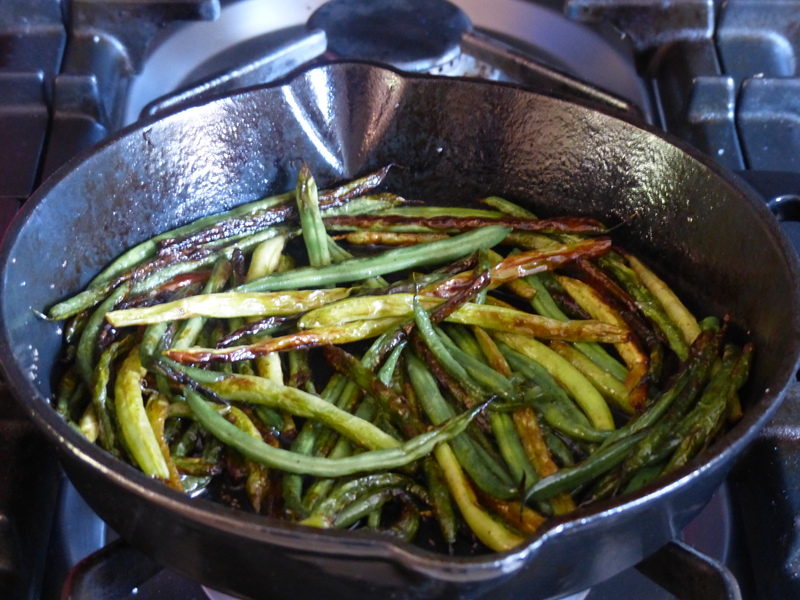 Place the oil, onion, garlic and ginger in a non-stick skillet over medium-high heat and cook for 3 minutes. Add the cumin seeds and cook for 1 minute. Stir in the tomatoes, green chili, garam masala and salt. Reduce the heat to medium-low and cook for 5 minutes, stirring regularly. 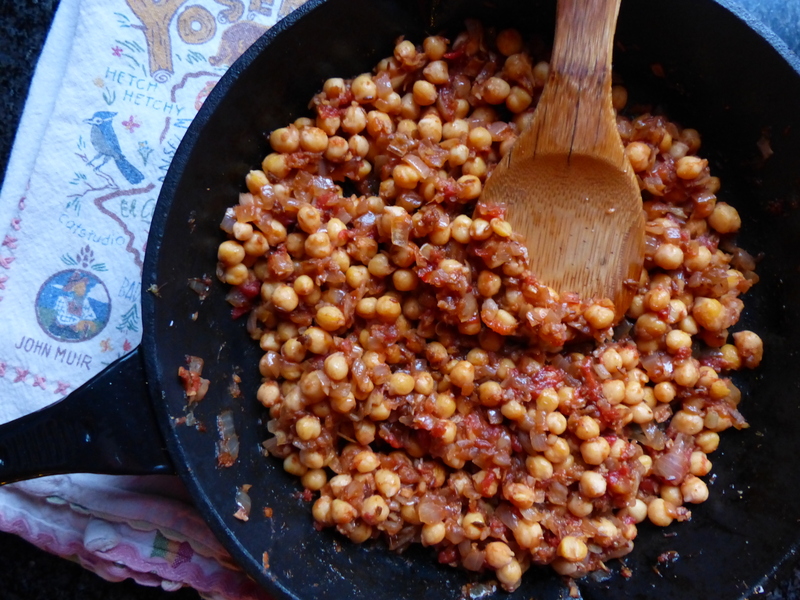 Add the chickpeas to the skillet and cook for 1 minute. Turn the heat off, cover the pan with a lid and let it sit for a few minutes before serving. 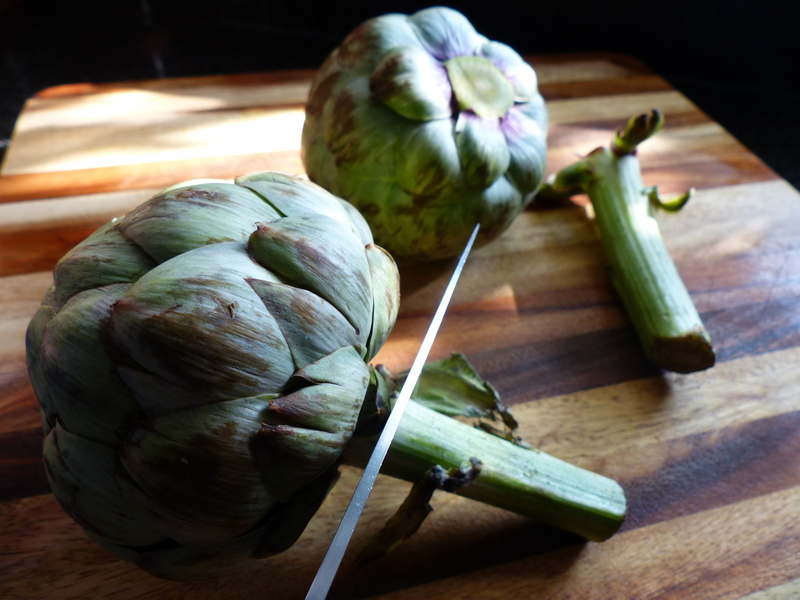 Garnish with a sprinkle of cilantro/coriander or chopped green chili, if desired. Serve plain or over rice. We are amidst the storm before the calm. The last minute shopping, decorating, baking. The school Christmas concerts, ice skating trips, packing for holiday travel. All leading up to a (hopefully) peaceful Christmas, New Years or whatever other upcoming celebrations you have planned with family and friends. So while a home-cooked meal is still as important as ever, I am not currently in the mood to labor through lots of chopping and fiddly food preparation. A whole-roasted cauliflower is therefore a welcome respite. No chopping at all!! Just an entire cauliflower slow-roasted until the exterior is crisp, brown and a bit caramelized and the interior is fork-tender. I love serving this whole. It looks beautiful and the family enjoys grabbing their own florets and dipping them. It’s a fend-for-yourselves type of side dish. Sometimes we do cut it into quarters, for fairness sake, though I think the fighting for your rightful portion is half the fun. Don’t skip the lemon creme fraiche dip. It is the cherry on the sundae – only this is cauliflower we’re talking about. 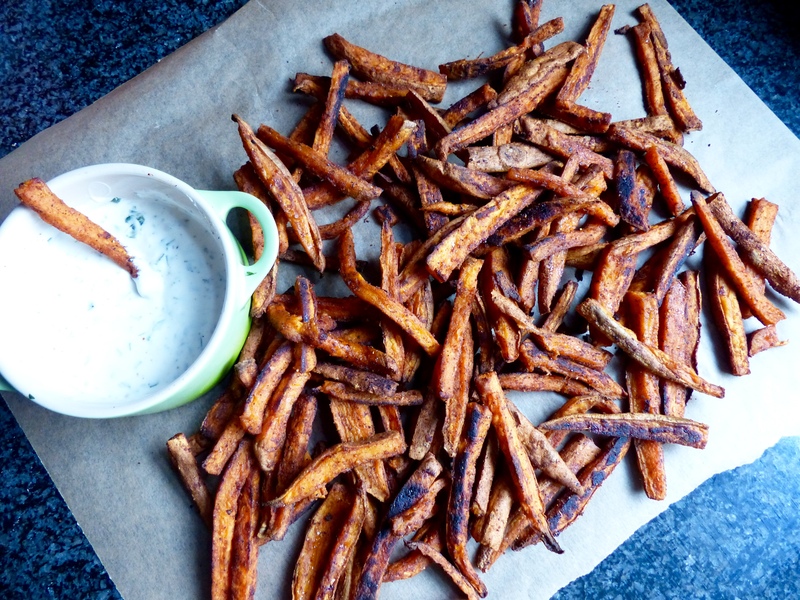 If you don’t have creme fraiche, substitute Greek yogurt or sour cream. This is yet another amazing Yotam Ottolenghi recipe. Check out the two others I’ve previously posted: Cauliflower Cake and Broccoli, Beans, & Peas with Sweet Soy Tahini Sauce. This recipe proves again that vegetables are anything but boring and there’s more to veg that steaming and sautéing. Try whole roasting!! Note: This recipe is for an average sized cauliflower (3 lbs or 1.5 kg). 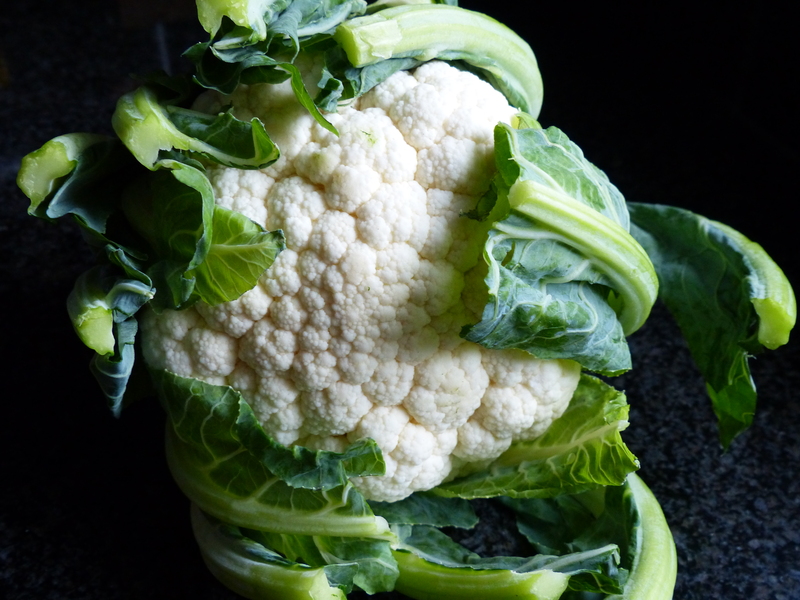 If you use a larger or smaller cauliflower, just use more or less of the butter and olive oil. 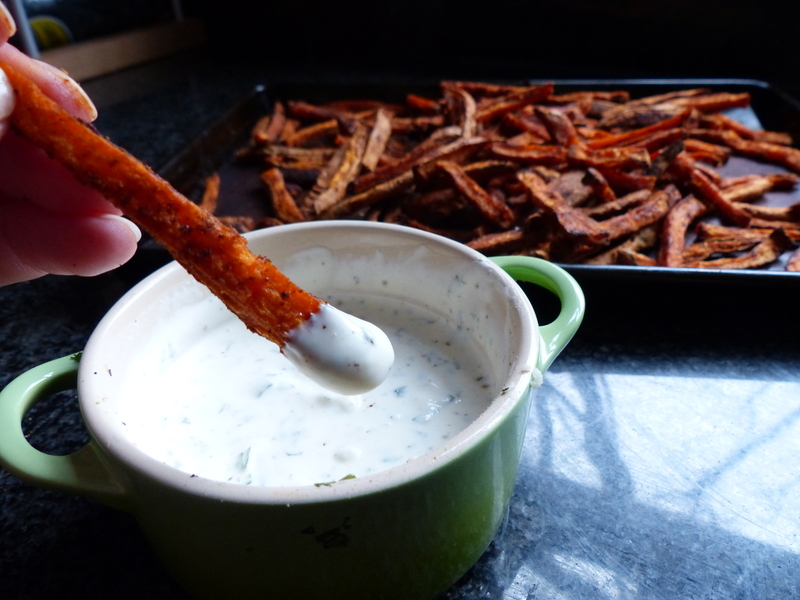 Also make a bit more or less of the lemon creme fraiche dipping sauce. Using scissors, lightly trim leaves at top of cauliflower, so that about 2″/5cm of cauliflower head is exposed. 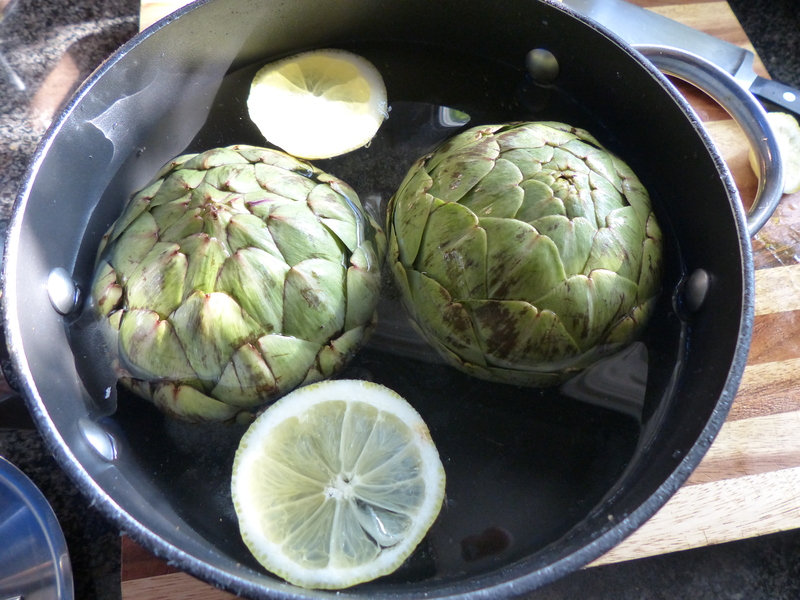 Fill a pan large enough to fit the cauliflower with salty water. 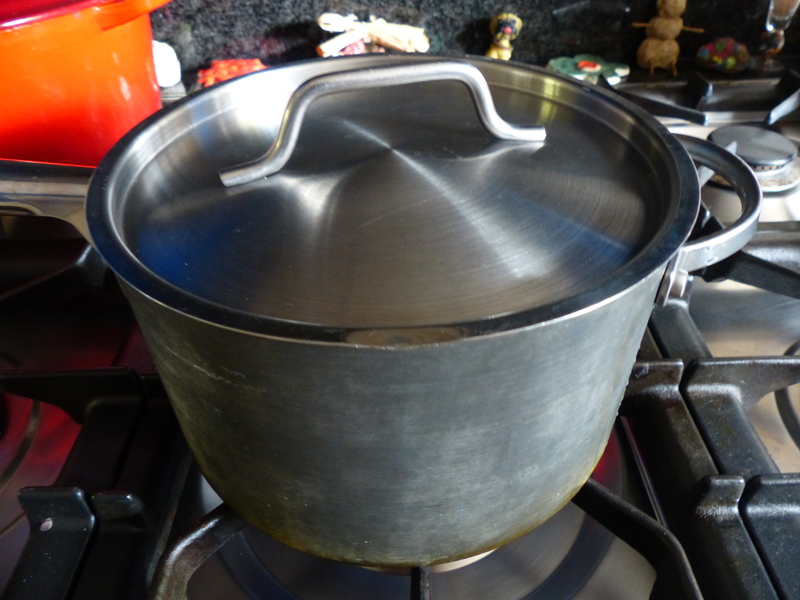 Bring to a boil and carefully lower the cauliflower (I used a large pair of tongs), exposed head down – it’s ok if the base sticks out a bit. Return to a boil and cook for 6 minutes. Transfer to a colander, head down, and let sit for 10 minutes. Preheat oven to 335º F (170º C). Mix butter and oil together in a small bowl. Put the cauliflower stem side down in a medium baking tray and spread butter mix on the white part (not the leaves). Sprinkle with salt and roast for 1.5 to 2 hours, basting about 3 times. Cauliflower is done when super-tender, has turned a dark golden brown, and leaves are crisp and charred. While cauliflower is roasting, combine the lemon juice and creme fraiche in a small bowl. Serve cauliflower warm with the lemon creme fraiche dip on the side. 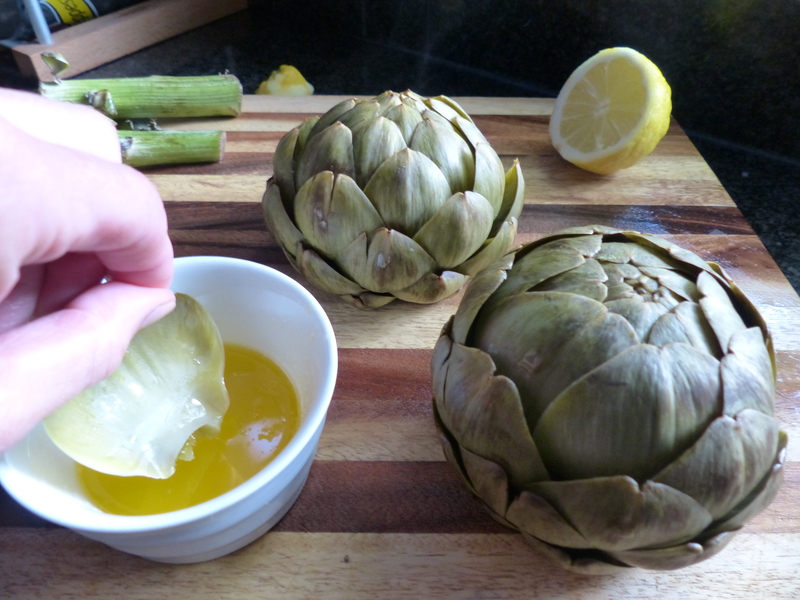 Can be served whole on the table for people to tear off individual florets with their fingers or you can cut into quarters and serve plated with a dollop of lemon creme fraiche. Earlier this week I was lucky enough to do a guest post on a fellow American expat in London’s blog, the lovely Angloyankophile. 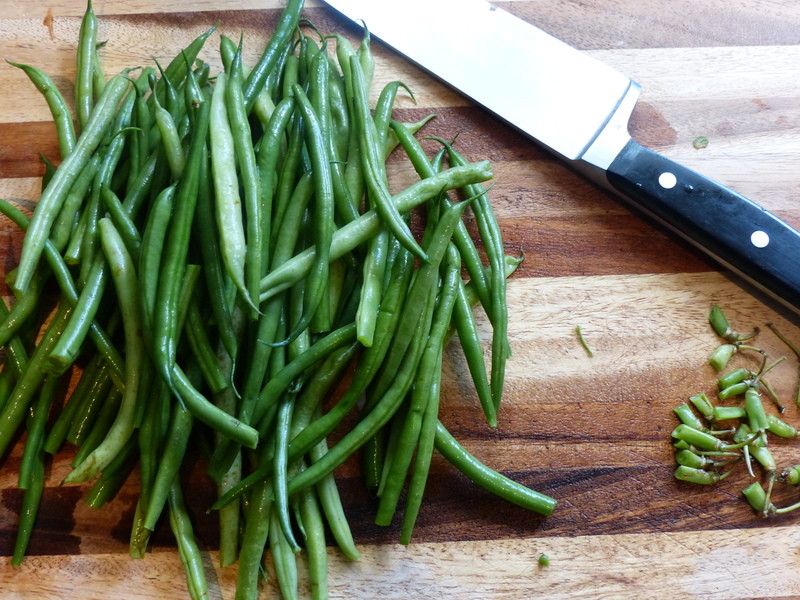 She was looking for some inspiration for Thanksgiving side dishes and I thought this Updated Green Bean Casserole was just right. 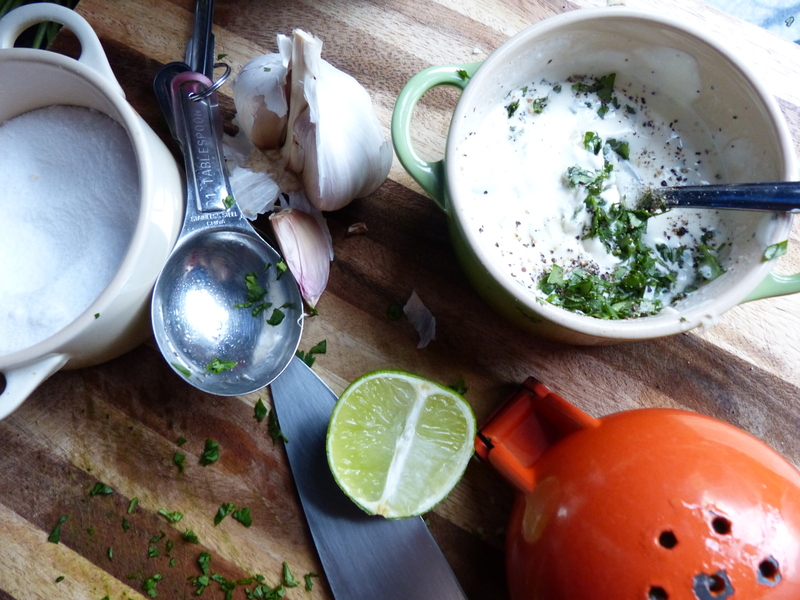 Check out the recipe below and be sure to check out her blog as well. She has lots of amazing London restaurant recommendations as well as beautiful lifestyle posts with home decor, jewelry, etc. Also, as Thanksgiving is less than a week away, good luck with your preparations. Check out my other Thanksgiving recipes – Herbed Oyster Stuffing and Spiced Cranberry Sauce with Wine. And stay tuned next week for a recipe for turkey leftovers. As an American living in London, Thanksgiving is the holiday when homesickness creeps in most. At Christmas, I miss my family, but there are cozy pubs with Christmas lunch, ice skating rinks galore, panto, Christmas markets, etc. At Halloween there aren’t many decked-out houses in the UK, unlike suburban America, but there are kids trick-or-treating, carved pumpkins, and the occasional costume party. But Thanksgiving in London is difficult. Being on a Thursday, life continues on as usual. There’s no lazing around the house during the day, chatting and playing games with friends and family, watching football, post-dinner walking and/or napping. It’s a typical Thursday with work and school. But we can still gorge ourselves silly! 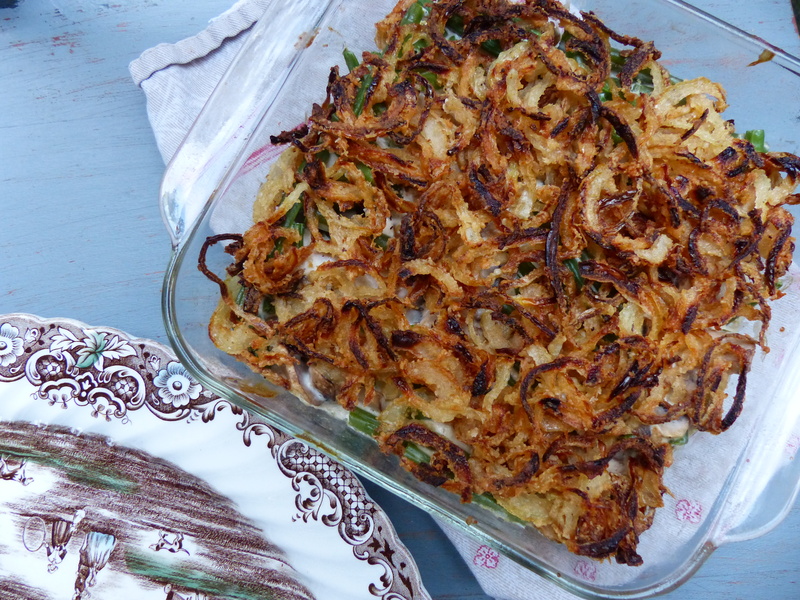 Green bean casserole is one of the most traditional and revered of Thanksgiving dishes. However when I finally fixed it myself (the beauty of Thanksgiving is everyone typically brings a dish, so someone else always made it) the reality hit that the majority of ingredients come from a can. That’s not how I cook – and I think more and more people are getting away from canned, processed foods and cooking with whole, fresh foods. So I set about updating this age-old favorite. 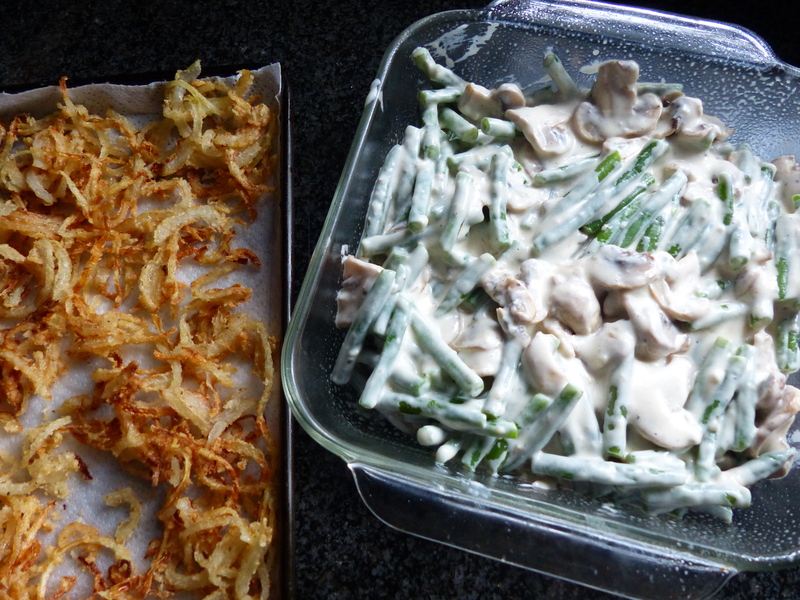 Canned green beans are replaced with fresh; condensed cream of mushroom soup is replaced with a homemade mushroom cream sauce and finally the topper of boxed “french fried onions” is swapped out for homemade fried onions. I cooked this last week for an early Thanksgiving celebration with my parents who were visiting from Wisconsin. My dad couldn’t get enough (honestly – he had it for breakfast the next day!) and he’s about as traditional as you get. So if you’re celebrating Thanksgiving or Christmas (goes just as well with a Christmas turkey) give this updated classic a try. Sometimes it’s good to play around with tradition. Note: You can assemble the casserole without the fried onions the day before (fry onions day before too and store in zip-lock bag). Store it in the fridge, then bake the next day according to recipe. If it’s coming directly from fridge, may need to add a few minutes to cooking time. 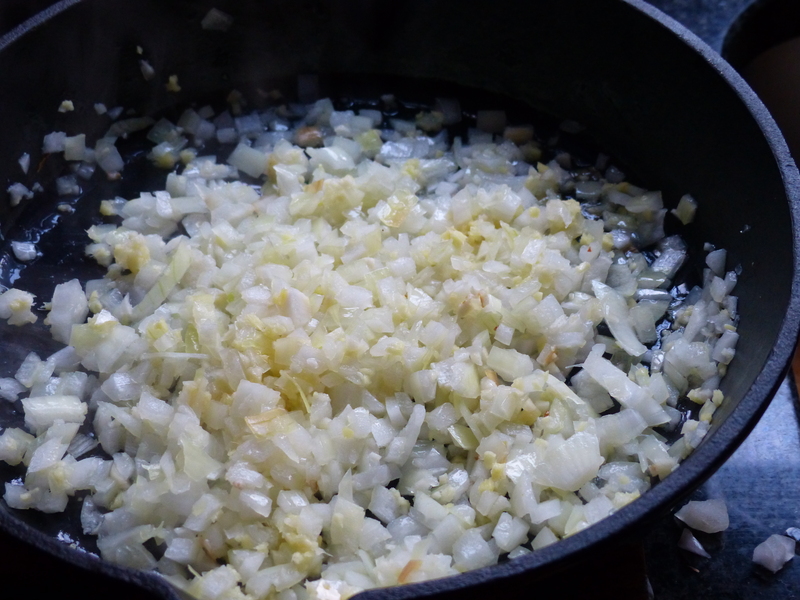 A wider (as opposed to a deeper) 2-quart dish is preferable as it will allow the crispy onions to spread out more. But use whatever you have – it’ll taste the same regardless. 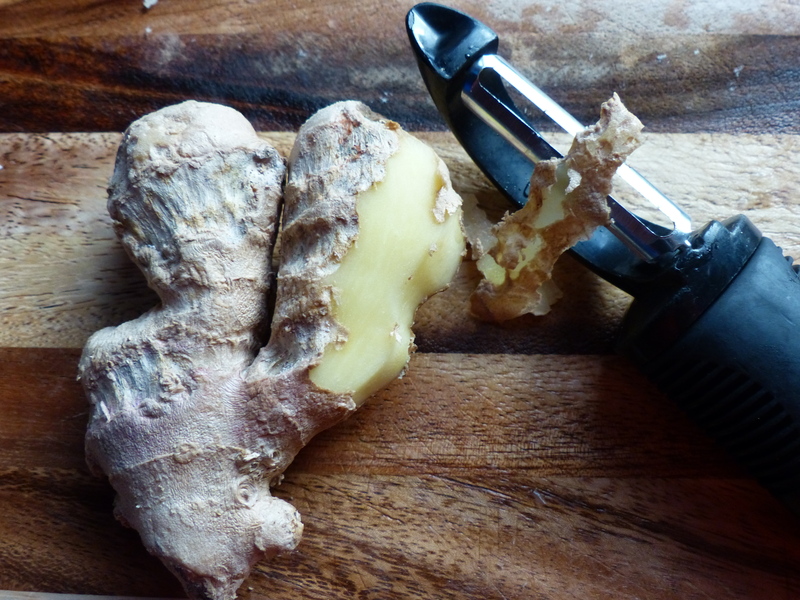 Keep whole nutmegs (they’re round and about the size of a plum pit) on hand and grate as needed. I use a microplane grater but you can also use the smallest holes on a box grater. Tastes so much better than ground nutmeg from a spice jar. 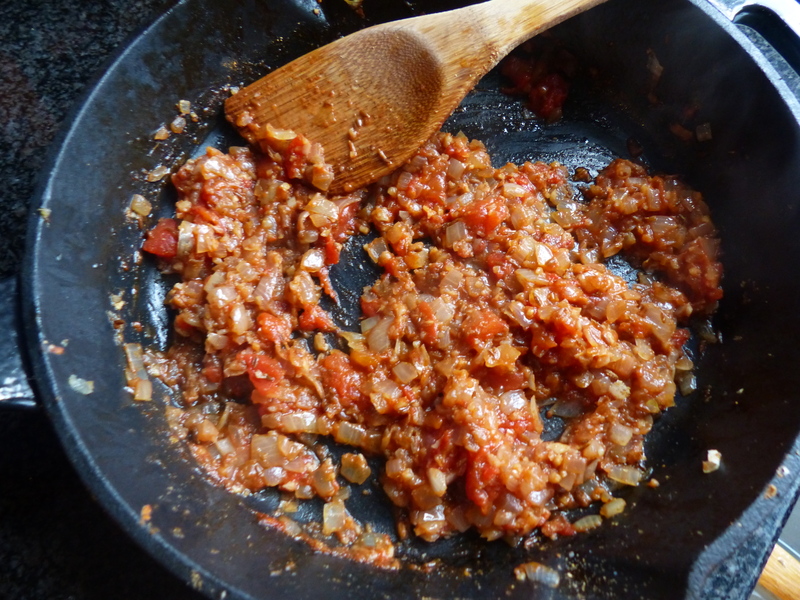 To make the crispy onions: Heat a 1/2 inch or so of vegetable oil in a large skillet (approximately 12” or 30 cm diameter) over medium-high heat until a drop of water flicked into it will hiss and sputter. While the oil is heating, place flour in a medium-sized bowl and season with salt and pepper. Toss the onion slices in the seasoned flour. Grab a handful of onions, shaking off excess flour, and fry in the hot oil in batches until light golden brown, about 3-5 minutes per batch (onions will get more color when they bake in the oven). 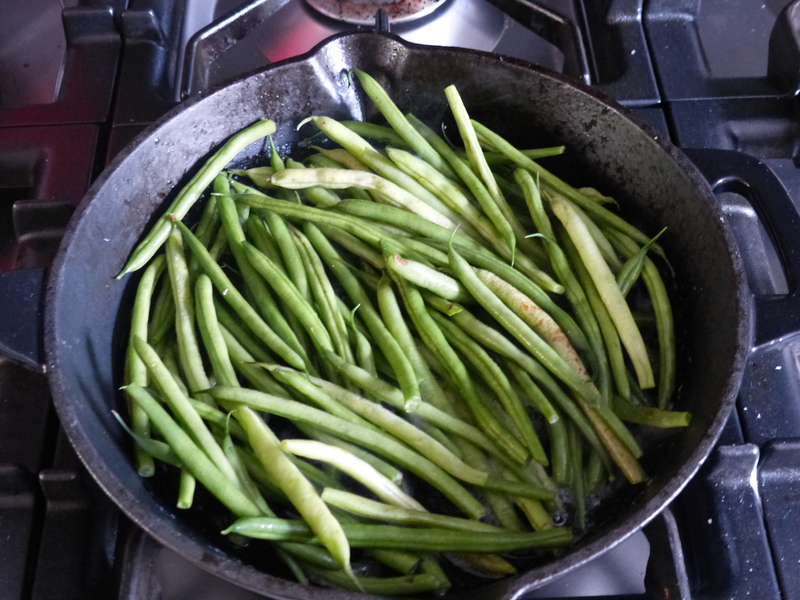 Remove with a slotted spoon, letting excess oil drip back into the skillet, and place on a paper towel-lined plate or tray. Melt the butter in a large sauté pan over medium-high heat. Add the mushrooms, salt and pepper and cook, stirring occasionally, until the mushrooms begin to give up some of their liquid, approximately 4 to 5 minutes. 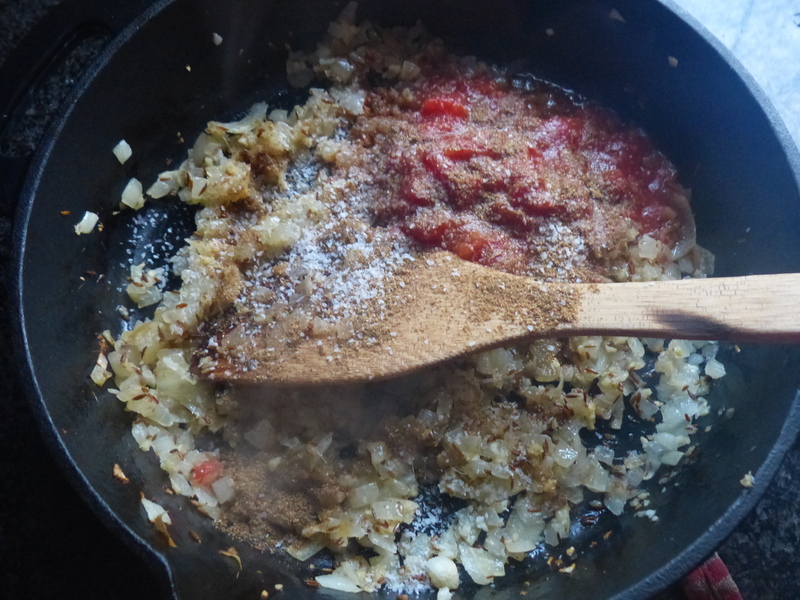 Add the garlic and nutmeg and continue to cook for another 1 to 2 minutes. Sprinkle the flour over the mixture and stir to combine. Cook for 1 minute. Add the broth and simmer for 1 minute. Decrease the heat to medium-low and add the cream. Simmer gently until the mixture thickens, stirring occasionally, approximately 6 to 8 minutes. 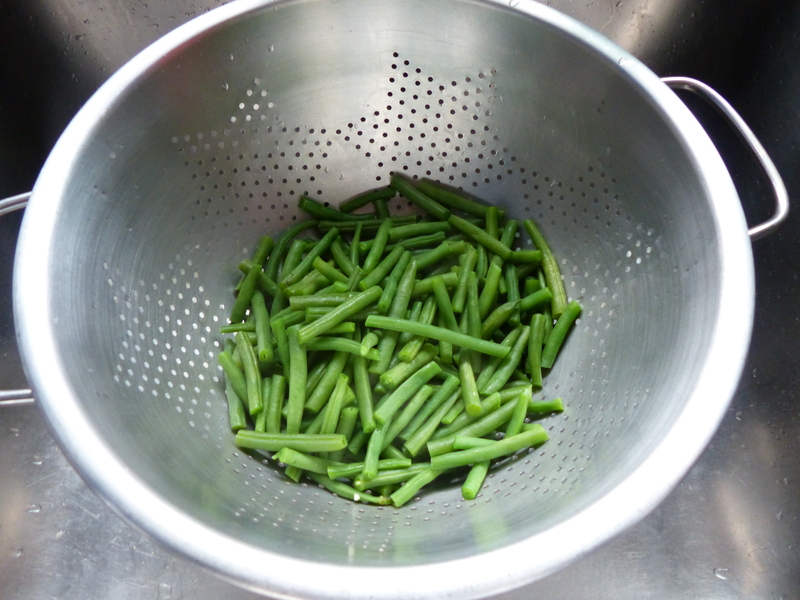 Stir in green beans and remove from heat. To assemble the casserole: Transfer the bean/mushroom mixture to a lightly greased 2-quart casserole dish. Bake for 10 minutes. Sprinkle with crispy onions and return to the oven for 5 more minutes or until casserole is bubbling and onions are a shade darker. Serve immediately.